Timothée Chalamet wears optical white high top Converse “Chuck Taylor” All Stars in the film. Seventeen-year-old Elio Perlman is about to experience true love for the first time. As Call Me By Your Name opens with images of archaeological finds displayed behind cursive credits, we are taken to Northern Italy in the summer of 1983 where we are introduced to the Perlman family. They live in a nice villa outside a small town surrounded by mature fruit trees, places to swim and sun bathe, and the beauty of rural Italy. Dr. Perlman (Michael Stuhlbarg) is a professor of archeology and each summer chooses an intern to come and stay with him for six weeks to help him catalog new findings and go on digs. Annella Perlman (Amira Casar) is a translator and mother to their seventeen-year-old son, Elio (Timothée Chalamet). Elio is well educated also, and has a talent for music, playing on the family’s Bosendorfer grand piano and transcribing into notation music that he hears on his personal music playback device. In the first scene, Elio and his girlfriend, Marzia (Esther Garrel), are up in his room cleaning up his clothing, as he must move to the smaller bedroom next door to accommodate this year’s intern from America, Oliver (Armie Hammer), who is just arriving at the villa. Oliver gets out of the car, says hello to everyone and then as soon as Elio shows him his room, he plops face down on the bed and falls into a deep sleep until the next morning. Elio starts taking more notice of Oliver. Over the next few days, everyone gets to know each other. Oliver and Professor Perlman have academic banter and mini-arguments about details. 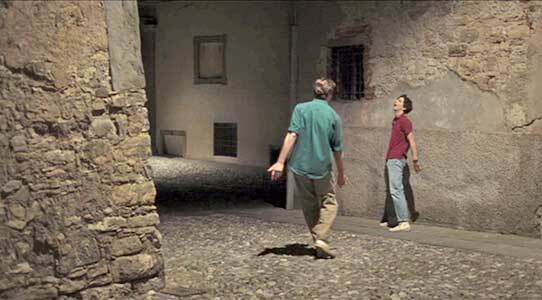 Elio and Oliver at first don’t connect; they have a musical discussion where Oliver thinks that Elio is conning him by never playing piano pieces the same way. That is Elio’s way of trying to put the talkative and opinionated Oliver in his place. But with not much else to do, Elio and Oliver go on bike rides together to see the nearby town and countryside. They start to develop a friendship that first becomes more than that when Oliver massages Elio’s shoulder one afternoon while friends are around playing volleyball and sunbathing. Meanwhile Elio’s relationship with Marzia is seemingly becoming serious. After they see Oliver in the local cantina dancing and kissing another local girl, they join in the dancing then go off swimming after some serious necking. The next day Elio decides to go with his father and Oliver to the coast where some new artifacts have been discovered. They don’t arrive back home until very late making Elio miss his scheduled meeting with Marzia. The next day Annella reads a story that she has translated to her husband and Elio about a knight who is unable to express his feelings for a princess he loves, wondering whether it is better to take the risk of speaking or to stay silent and die. The next time Oliver and Elio go on a bike ride together, Elio takes the risk and indicates to Oliver that he has feelings for him. Oliver’s reply is “Pretend you never said that.” But Elio persists and takes Oliver to a small creek and swimming hole that is his “private place”. After swimming they lie together in the sun and kiss for the first time. Elio wants to do more, but Oliver replies that they haven’t done anything really wrong yet. We discover that Oliver is Jewish, like the Perlman family. 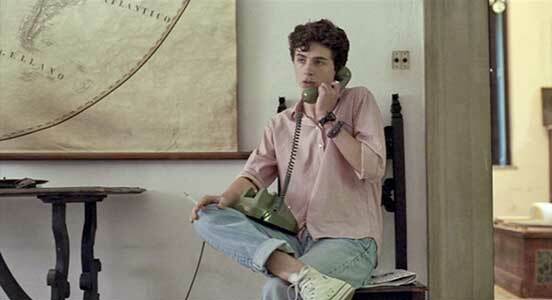 Elio starts to wear a six pointed star necklace like Oliver, something that his parents never encouraged, preferring to keep a low profile in a village that is overwhelmingly Roman Catholic. Elio shows Oliver around town. Their relationship gets serious after Elio shows Oliver his secret place to be alone. Call Me By Your Name received Oscar nominations in multiple categories for Best Motion Picture, Best Actor in a Leading Role (Timothée Chalamet), and Best Adapted Screenplay (James Ivory), and Best Original Song (Sufjan Stevens for his song “Mystery of Love”). The film was rated in the top ten best films for most of the other awards, and did win some of those awards. Longtime screenwriter James Ivory won the 2018 Best Adapted Screenplay Oscar for his script to Call Me By Your Name based on the novel by André Aciman. You can see why from the seamless way Ivory incorporates the important plot elements into the film’s beautiful backdrop of summer living in northern Italy. Director Luca Guadagnino and cinemaphotographer Sayombhu Mukdeeprom provide us with a lush yet relaxed scenario of warm weather, places to swim and sun bathe, mature fruit and shade trees to relax under, and a charmingly simple life style. Timothée Chalamet did deliver an Oscar-worthy performance as a teenager on the cusp of adulthood, knowledgeable in many ways but naive in others as he experiences his first real true love. He gives us a wide range of emotions from giddiness to sadness and swagger to vulnerability as his love affair goes through its stages and has consequences with his other friends in the small town where he lives. We are told from the beginning that this romance may not be right and it may not last, but even with that caveat, emotionally we experience much of it the way that Elio did. Some commentators have stated that Armie Hammer, whose was in his thirties when this was filmed was too old to be believable as the 24-year-old Oliver. This is point is well taken even though Hammer’s performance was very good. He just didn’t quite look the part as much as Chalamet (who was only twenty at the time of filming) did. Note should be made of the good musical decisions for this film. Much of the sound track was made up of solo piano music, pieces that talented young pianist Elio would choose to play. There was a good selection of piano pieces by John Adams, along with some Erik Satie, Bach, and Ravel that added a nice contemporary touch to the soundtrack instead of the usual romantic symphonic score most films with this setting might use. Call Me By Your Name is clearly a well made art film on a subject that is still controversial to many but now has a greater acceptance in society. Cinema has come a long way in its portrayals of gay sexuality since the turn of the century. Oliver and Elio romping around Bergamo. Elio in the telephone to Marzia. Timothée Chalamet in his role as Elio wears optical white high top chucks in the film, a popular choice for young people in Italy as they are here. There aren’t many close ups; the best shot of Elio is when he calls Marzia after ignoring her for a couple of days. 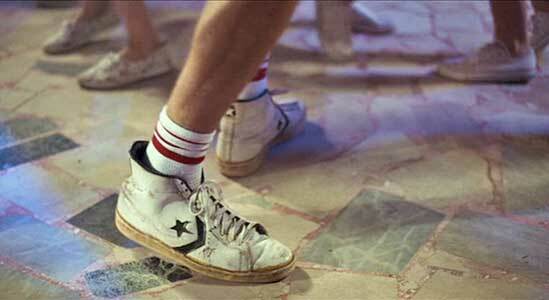 Armie Hammer in his role as Oliver wears white leather Dr. J high tops throughout the film. The camera provides us with a close up when he is dancing with Chiara, a local girl in town who he has been flirting with. Camera closeup of Oliver dancing in his leather Dr. J high tops. Call Me By Your Name. (2017) Timothée Chalamet, Armie Hammer, Michael Stuhlbarg, Amira Casar, Esther Garrel. Directed by Luca Guadagnino.